This idea totally makes sense and would only cost $5.6 billion dollars! Last week, Caltrans and Metro released the long-awaited draft environmental impact report for options to improve transportation near where the I-710 ends, 4.5 miles south of the I-210. 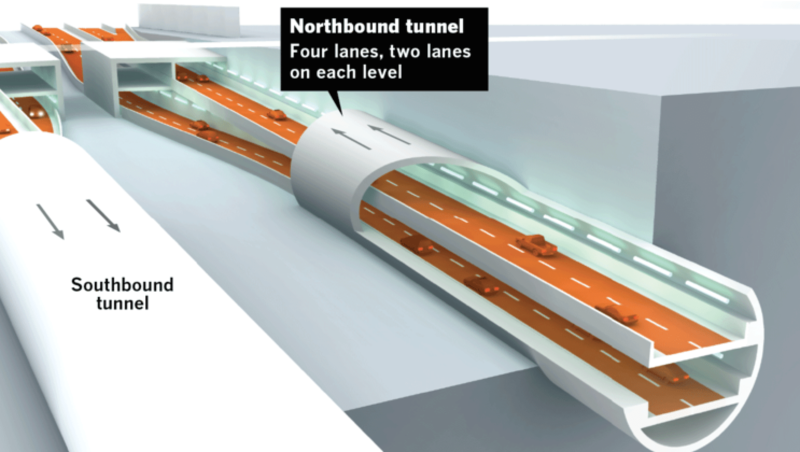 As usual, the discussion around the document depends on whether or not one thinks it’s a good idea to dig a five-mile tunnel 150 feet underground to connect one freeway to another freeway. Metro will receive public comment on the report starting on Thursday of this week and continue collecting until July 6. Details on how to comment are available at the end of the article. In addition, Streetsblog will submit this article, and any others published between now and July 6, as part of the public record. Following the report last week that traffic has not improved at all following the massive and costly widening of the I-405 through the Sepulveda Pass, one would think the media might consider a $5.5 billion double-decker tunnel or $3.1 billion single-level tunnel a farcical proposal not worthy of further discussion. One would be wrong. Most media played it straight, announcing the report’s findings, the public comment period, and other basic factual information. “Closing the 710 Freeway gap would take years and cost billions,” reported the Times. “Caltrans Releases EIR For Proposed 710 Freeway Extension,” snored Patch. But much of the rest of the media applied a more critical eye and came down hard–against the option to provide better transit service instead of digging a gigantic tunnel. The $240 million cost of the bus rapid transit option, which is 7 percent of the single-level tunnel option and roughly 4 percent of the double-decker tunnel option, is the subject of the headline “Busway option to close 710 freeway gap would cost five times early estimate” at KPCC. That’s right, a report with a Metro logo on it dismisses a light rail proposal because it would be too noisy, pollute too much, be too noisy and too ugly. Way to have some ideological consistency. So let’s look at the last transit option standing.One of five options, in addition to light rail, that was considered for “closing the gap” (a goal which pretty much guarantees that the best solution would be a gigantic tunneling project) is to build out the bus system by adding Bus Rapid Transit to the impacted area. An initial estimate of the project placed the capital price tag at just over $50 million. As KPCC notes, that number grew in the EIR to $240 million. When asked what caused the growth, a Metro spokesperson refused to comment to KPCC reporter Sharon McNary. While this growth is troubling, the $240 million price tag still falls well within the project budget. Measure R, the 2008 Transportation Sales Tax, put aside $780 million for the Big Dig or whatever project is chosen to improve transportation in the region. The other argument in favor of the expensive freeway tunneling projects is that, according the EIR, they will do more to “reduce congestion” than the transit options. If one ignores all of the highway planning that has been done in Greater Los Angeles over the past decades, it is possible that someone could believe this to be true. But, for the sake of argument, let’s pretend every freeway expansion project that’s been completed in recent memory was a complete success. I can get in a car on the Westside and drive to my brother’s in the Valley in twelve minutes. It’s autotopia! But even in this exciting world where highway expansion means less congestion, the project still does not actually make sense. The price tag of at least $3.1 billion–and let’s remember that Caltrans’ estimates for the 405 one-lane widening were low–is nearly fifteen times as much as the bus option. As mentioned above, Measure R set aside nearly three-quarters of a billion dollars for the 710 project. Even if one believes Caltrans’ estimated cost, there is over $2.25 billion needed to even consider construction. Supporters of the tunnel point out that the project is in the regional long-term plan, but that means that funding it with state and federal funds would need to be the top priority of the lobbyists and politicians at Metro. If the tunnel backers are this committed to the tunnel expansion, that’s their call. But for the region to compete for funding for this project it would need to become the region’s top transportation priority. Is that really something that anyone wants to see? April 11, 10 a.m. to 4 p.m., East Los Angeles College, Rosco Ingalls Auditorium, 1301 Avenida Cesar Chavez, Monterey Park. TONIGHT March 9, 6 p.m. to 8:30 p,m., Cal State Los Angeles. This EIR is so upsetting in so many ways. It makes such a huge deal about a single bridge for light rail that would visually impact drivers’ ability to see the San Gabriels while driving up the 710, but it does very little to spell out the pollution impacts of all the smokestacks that would be perpetually belching out diesel and other vehicular fumes from a freeway tunnel. Talk about visual impacts! Even if I didn’t have a horse in this race, the bias throughout the report is borderline insulting, and CalTrans and Metro really don’t appear to have any other desire in front of them other than to build the friggin’ freeway. They ridiculously claim that the freeway would remove a handful fewer parking spaces and have less impact on surface streets than would light rail. Technically, the light rail stations would remove a few parking spaces, but practically the access they would provide is light years greater than what the freeway tunnel would provide for area residents. It’s just a shame, because LA can do so much better than this EIR portends. The visual impacts assessment is laughable but the saddest thing I’ve heard is that Metro is seriously against light rail and busway option. In the report they actually say the those options would increase VMT, for me that a first to see that transit projects would actually increase VMT. And just because this project EIR/EIS pre-dates SB 743, they act as those induced demand won’t occur and that they can’t predict how the build options will effect GHG. Come on this is ridiculous. It also became pretty obvious that they really want this extension to relieve traffic on the I-5 and how this singular highway project will better region freeways. I say highway because if it can be funded by some P3 mechanism it would have to be tolled. The purpose and need for the “gap” is just a flawed beginning point, the SGV area are the ones that will bear the problems of the highway tunnel and ti will take all of our funds dedicated to this region to get it built, its just a waste. Also thanks for being a rational reporting voice on this subject, its sad but not surprising to see the big papers disregard cost/spending of public funds and only talk about how it will improve auto traffic which we all know it wont do in the long run (or even short-run possible also 5 years to built using 4 TBMs come on really). 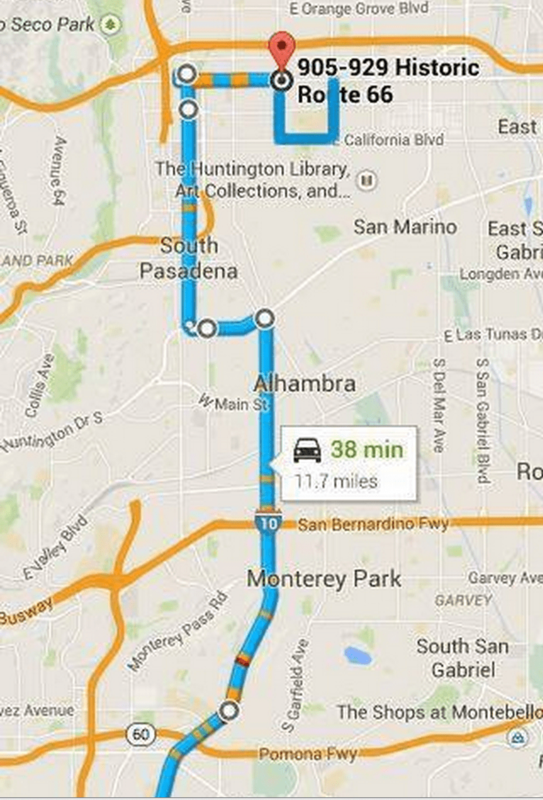 Did you mean “… south of the I-210. As usual…” in the first paragraph? I demand a more visually stimulating title page for any highway capacity expansion project valued at 300 million or more! I hope your readers listened to the segment about this project on KPCC Airtalk yesterday (It is still available on the station’s website). Mayor Pro Tem of La Canada Flintridge and Barbara Messina of Alhambra were guests. It is a MUST for anyone following this project and everyone who thought the DEIR/EIS would be a valuable, responsible document. The things that Damien discusses here are just the tip of the iceberg. $40 million of the taxpayers’ Measure R dollars went toward producing 26,625 pages (over 53 reams of paper) and the public will have no better understanding of the project than they did when it began. Airtalk yesterday (It is still available on the station’s website). no better understanding of the project than they did when it began. One thing to note is that the length of the EIR (over 2,000 pages) precludes just about anyone from actually reading it in its entirety. So CEQA, a law whose stated purpose is to inform the public of the environmental impacts of development, has failed to produce a document that anyone holding down a job (that doesn’t involve reading EIRs all day) could reasonably read. Secondly, I have to believe that in an age of concern about climate change, we can do better than spending billions of dollars to build four underground car lanes that need constant mechanical ventilation. The sheer waste of it is the most offensive part. I look forward to reading the executive summary of the DEIR and leaving a formal anti-tunnel comment. If Metro enables CalTrans in building this boondoggle, they just lost my vote for any transit tax measures in 2016 or beyond. I think the transit activist community should do the same if they have any brains. I mean, this is just insane… we can’t even afford to maintain our streets in LA! Chewie, the entire document is over 26,000 pages. Even more of a challenge to get through. Even the executive summary is lengthy. Good luck getting trough even that. Measure J lost by the slimmest of margins due to four widely attended public meetings with many angry protesters of the 710 tunnels which was covered in the press the few months before the vote. If the 710 tunnels are not removed from the Measure R2 list, the same thing would happen. The Measure J opposition was outspent over $100,000 to $1 and still pulled of the defeat. For those of us that want more transit and would support Measure R2, stand up and protest the tunnel boondoggle. Tell the Metro Board to end this foolishness and remove it from the LRTP. The most insidious part is that without reading the Draft EIR in detail and responding to specific issues raised by report, the final EIR will just completely dismiss comments out of hand as “not addressing a specific issue raised by the Draft EIR”. Have we learned nothing from Boston and Seattle? Say hello to the $10bn highway. Anyway, even assuming that it stays on budget, each mile of this project will cost more than 1000 miles of Class I bikeway or 2000 miles of protected bike lanes. That would move a lot of people. Also, speaking of bikes, Caltrans is required under CA SHC §887.8 to provide access for bikes along or adjacent to their highways. So what’s their plan for doing that here? From the beginning I’ve always suspected BRT and LRT are straw men alternatives designed to fail, and as a tunnel supporter I wonder why they even waste the money on such straw men. The BRT option is poor due to the low ridership of the existing 762 line, while LRT has too many tunnels and grade separations. On the other hand tunnel opponents are being inconsistent when they bemoan the loss of traffic who won’t see the businesses on Fremont, while simultaneously complaining about the diverted traffic who won’t pay the toll for the tunnel. The EIR studies a two lane in each direction single tunnel option, which would likely meet the needs of regional traffic. Of course they are straw men. Instead of looking at the LRT extensions of the Gold Lines, Foothill and Eastside, east, they put the route in the same north south corridor as the tunnels. This proposal was clearly meant to fail. In 2007 SCAG estimated the toll tunnels cost at $11.8 Billion. That is a more accurate figure than the laughable $5.4 Billion. Who holds Metro accountable? I guess it’s us the taxpaying voters. Drumbeats are slowing getting louder…vote no on Measure R2, unless 710 toll tunnels are removed. This only shows the near impossibility of passing a transportation tax increase in the foreseeable future, with the 2/3 requirement, John Mirisch and his ilk demanding two additional members on the Metro board, advocates of the Gold Line extensions, bicycle projects, etc requesting their share, and local residents wanting addition or subtraction of the 710, plus any measure being stick at the end of an extremely long November 2016 ballot. I empathize with Move LA who have to herd all these cats for managing a proposition that has an extremely high possibility of failure. Wow, excellently put. I definitely don’t want my city legislators lobbying that this is the top priority for the region. Traffic simply isn’t that bad, neither on the surface streets in Alhambra on the way up to Pasadena, nor getting off the 710 or bottlenecking at the 10/710 junction… The 10 fwy east-west is by far worse, the Hollywood connector at 110/101 is awful. How ’bout using that money to expand light rail? a 5 mile stretch in the San Gabriel Valley does not merit Center of Attention and certainly is not the bane of Los Angeles’ freeway woes. Calwatch, to be clear, no 710ers want the toll tunnels eliminated as a project and the remaining $700 million allocated toward the Gold Line Extensions which are under or not funded yet. Light rail is a much better use of the money. I’m not sure why we can’t take at least some facts in the EIR at face value, and those facts are that no alternatives actually solves the problem. There’s been a 40-year traffic jam in the area, spilling out onto the 5, 10, 101, 110, 210, and 605, which makes it truly a regional issue. If LRT/BRT etc. could work they would have been done already. Why bother proceeding with an option that is more expensive, harder to build, and generates copious opposition? Which option will cost the most amount money? The Freeway Tunnel. Which option will INCREASE the amount of driving people do regionally? The Freeway Tunnel. So the option that is the most expensive will also do nothing to reduce car travel regionally or provide alternatives to the automobile. Why is the freeway tunnel option even on the table? With $5 billion the San Gabriel Valley could be blanketed with a comprehensive bus and bicycle network which will do far more to help us achieve our sustainability policy goals. Would there be more support for this tunnel if one of the four lanes in each direction were dedicated for BRT? Would that compromise interest both sides? Absolutely not. BRT in a tunnel would be duplicative. My option would have the tunnel be HOT anyway, with discounted passage for declared carpools enforced by video camera with infrared detection to recognize and report cheaters. That sounds like the green line… it’s still a massive, unnecessary freeway and there’s just no way of justifying it. There is no compromise because people are split on whether or not the freeway should happen at all, not how many bells and whistles you throw on it.